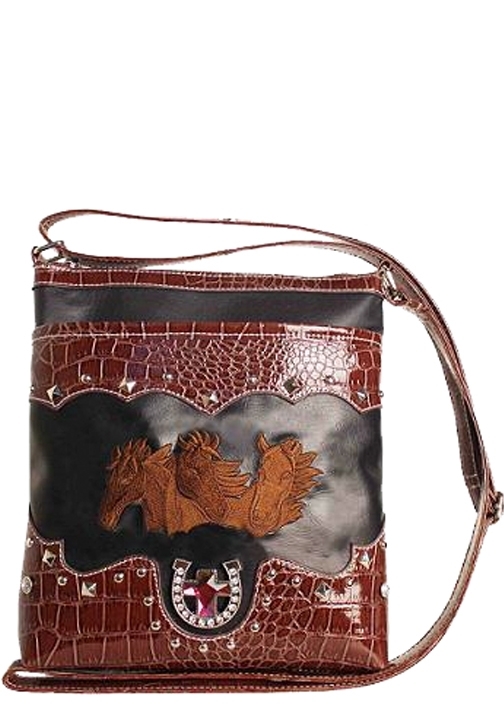 Order Horse and Western Theme handbags online in a variety of styles and sizes. Lila Blakeslee''s embroidered horses and horseshoes create an attractive pattern on this perfectly sized bag in durable faux leather. Two-way zip top opens to a lined interior with inner zip and open pockets. Two open outside pockets give quick access to cellphone or keys. Strap is 18" long. Flat bottom. 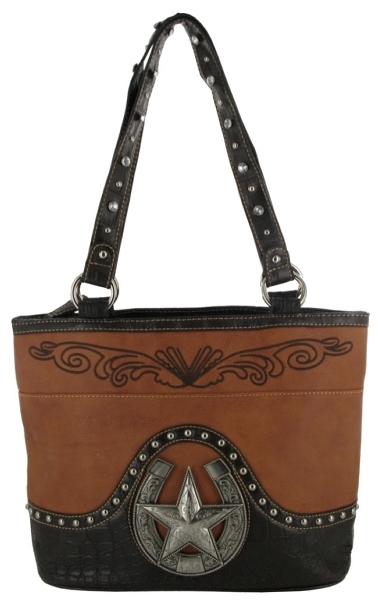 17"W x 8 1/2"H.
Classic hobo-style bag has embroidered roses, a horse head-in-horseshoe concho and long leather fringe. Silvertone studs and clear crystals add shine to the two-tone brown and black faux leather. Zip top opens to fully lined twin compartments with inner zip and open pockets. Open pockets on sides and open and zip pockets on back. Flat bottom with purse feet. 13"W x 10"H with 18" long strap. Six colorful horses in unmistakable Laurel Burch style are printed on both sides of this roomy shoulder bag, accented with metallic inks and embroidery. 100% cotton canvas. Zippered top opens to a lined interior with inner zip pocket and two open end pockets. Strap is 23" long. Flat bottom. 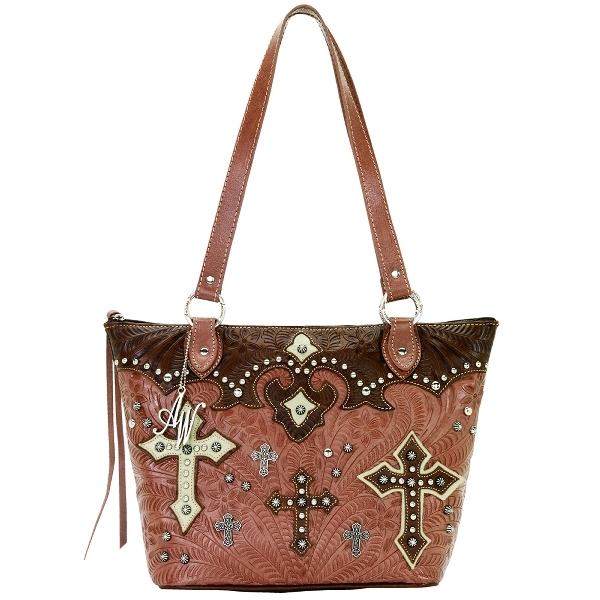 14"W x 9"H.
Genuine leather handbag celebrates the tradition of Western tooled designs, accented with clear crystals and faux leather trim. Foldover magnetic snap buckle; zip top opens to a roomy lined interior with zip and open pockets. Elastic pen holders and inner key loop. Outside features zip and open pockets for easy access. Flat bottom with purse feet. Braided straps are 28" long. 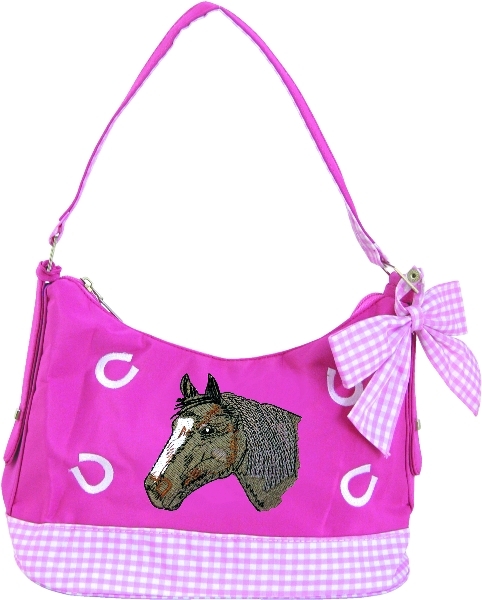 12"W x 8 1?2"H.
Compact, zip-top hobo in buttery-soft leather is embossed with a running horses patch on front. Fully lined with inside pockets. Outside zippered pockets on front and back. Strap is 17" long. Flat bottom. 13"W x 8"H.
Compact zip-top bag features a tapestry-style image of horses in rich color, with a Southwestern border along the top. Fully lined. One zippered pocket outside and another inside. Flat bottom. Detachable shoulder strap adjusts from 28" to 52" for cross-body use. 50% cotton/50% poly. 12"W x 8"H.
Supple faux leather bag with concho and cross overlay is a convenient size to hold your essentials. Moc-croc trim has silvertone studs with amber and clear crystal accents. Zip top opens to twin lined compartments with inner zip and wall pockets. Back side-zip pocket for easy access or concealed carry. Double straps are 24" long, with silvertone studs and metal rings. Flat bottom with purse feet. 13"W x 8 1?2"H. Comes with a matching wristlet clutch with zip closure, carry loop and lobster clasp. 8"W x 4 1?2"H.
Star w/ Horseshoes Purse. 13.5" wide. Star w/ Horseshoes Flat Wallet. Cowgirl night out or day dreaming at work, P&G Leather Collection brings you hot, affordable western fashion accessories that keep you and your bank account looking great!100% Genuine Leather & Up-to-Date Designer Western Fashion that turns heads. Even the price demands a double-take. 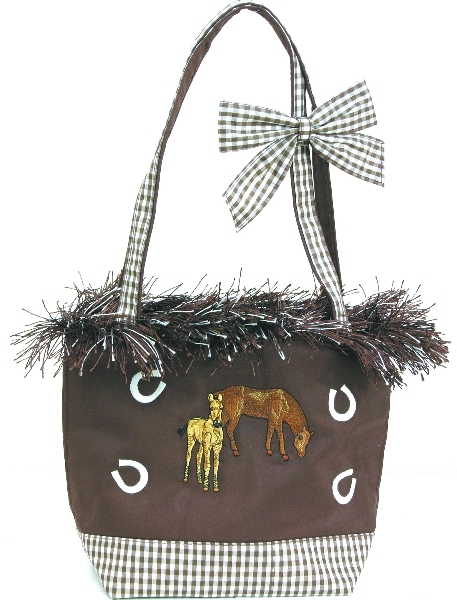 You can't afford to not look good...Color:BrownSize:13.5"
This stylish bag features Medicine Horse from the Trail of Painted Ponies. Measures 16" x 12" x 3". 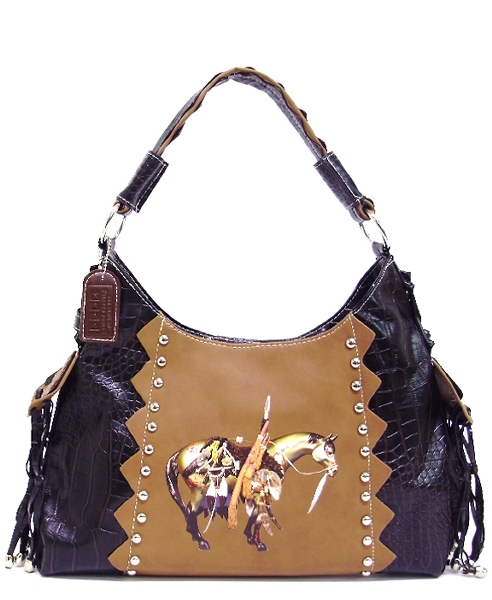 MORE Western handbags and totes at Sheplers.